Accuweigh Sydney branch recently installed upgraded weighbridge load cells at the RTA’s Marulan checking station near Goulburn in New South Wales. The original weighbridge load cells supplied by an alternate manufacturer failed due to lightning damage and required replacement. Four Flintec weighbridge load cells of 50t capacity each were supplied and fitted to the number 3 deck of the multi-deck weighbridge to allow truck weight testing to continue. 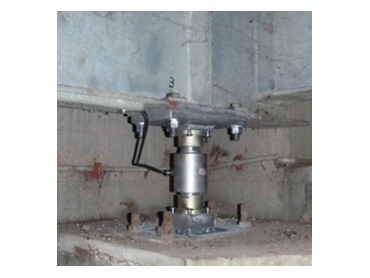 The Flintec RC3 weighbridge load cells are manufactured in stainless steel with an IP68 rating and are fitted internally with lightning surge arrestors to minimise potential lightning damage. The design of the Flinted RC3 weighbridge load cells is very compact for a 50t capacity and the load cells can be easily fitted within the existing height occupied by the previous load cells. Accuweigh carries conversion hardware to allow Flintec load cells to replace most alternate brands of weighbridge load cells at short notice to minimise weighbridge downtime. This weighbridge comprises four individual weighbridge decks which are each separately trade approved for weighing up to 30 tonne each. The combined weighbridge deck weights have a total weighing capacity of 120 tonnes and are displayed by a digital summing indicator. Accuweigh has weighbridge crews and test trucks located in each mainland state providing complete after sales service on all brands and types of weighbridges.